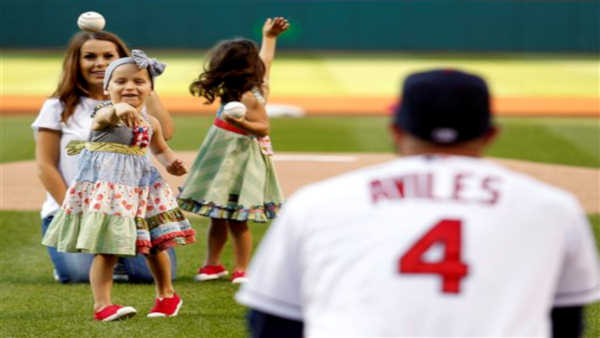 CLEVELAND -- The twin 4-year-old daughters of Cleveland Indians infielder Mike Aviles threw out the ceremonial first pitches before Thursday night's game against the New York Yankees. Adriana Aviles was diagnosed with leukemia in May and has been undergoing treatment at Cleveland Clinic. She was joined on the field by sister Maiya. Aviles, who has been placed on the family medical emergency list twice to spend time with his family, caught the pitches from his daughters. They received a loud ovation from the Progressive Field crowd. "The biggest thing for me is my joy comes from my kids," Aviles said "I have three girls and a boy on the way. I enjoy just seeing them happy. It makes me happy. That's what you want to do as a parent, you want your kids to be happy. You don't want to see them crying. You want to see them always laughing and joking. When they're having a good time, I'm excited." Owner Paul Dolan, general manager Chris Antonetti and several Indians players have shaved their heads in support of Aviles' family. A group photo was taken earlier this season in which players and front office personnel wore orange "Team Adriana" T-shirts. "I'm sure it will be one of the more touching first pitches I've ever seen," Indians manager Terry Francona said before the game. "I know for Mike and his family, it will mean a lot to them but it will also mean a lot to us."